Michael James Wallace Ashley is a British billionaire retail entrepreneur in the sporting goods market. He is also the owner of Newcastle United after paying around £135 million to buy the club in 2007 from their long-term chairman and owner Sir John Hall. Newcastle United may have one of the best managers in the world, but even Rafa Benitez couldn't do anything if the club's owner is least interested in the club. Here is the fact that will perhaps prove my statement above, the club record signing is still Micheal Owen from Real Madrid in 2005 for 16.8 m. Yes, you read that right. 2005 which means since Ashley took over Newcastle haven't broken their transfer record. Last season when they finished 10th in the Premier League things started to look better for them as fans expected a transfer window that will at least earn them a place in Europa League. But that didn't happen, and surprisingly they didn't even spend as much as they profited from the players they sold. As expected Newcastle now are currently sitting in the relegation zone in the 19th place. 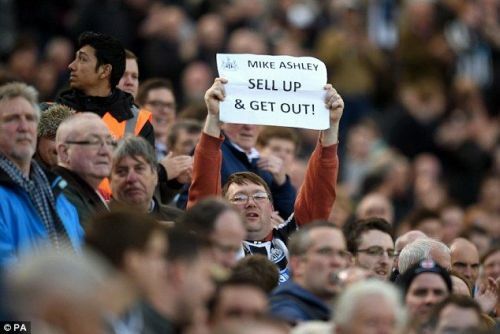 Chaos is erupting among their fans as they don't know what Ashley wants. He is trying to sell the club obviously make him a profit, and indeed, someone who is interested in rebuilding the club can take over. Although the rumours are that he is trying to sell the club, these rumours are the same since 2014. The worst is yet to come if things are not solved by January 2019. I really don't even think Rafa will stay at the club because if Newcastle might be relegated again and they sack him, not many clubs would like to hire a manager who lead his side into relegation.